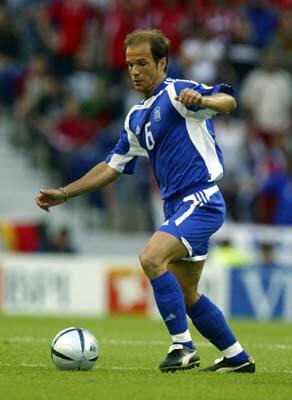 Greece Soccer Team - EURO 2004 Champions - Angelos Basinas - by La Cancha-News On World Cup 2006 - "World's Leading Soccer Magazine!" While he is perhaps at his best when bursting out of defence, Angelos Basinas's key strength is his ability to adapt to playing a number of roles. Basinas is a veteran of the outstanding Greek Under-21 side of 1998 who only narrowly failed to beat Spain's equally gifted young team to the UEFA Under-21 Championship. He made his full debut the following August in a 3-1 victory against El Salvador and has since proved a regular, and consistent, performer. He cemented a starting place late in UEFA EURO 2004, keeping his place for the finals. Basinas converted the penalty that proved the winner in the opener against Portugal, and played the full 90 minutes in the final as the hosts were beaten again. A product of the club's youth system, Basinas' combative style masks a calm, experienced manner and he has proved a valuable asset to Panathinaikos since first donning the famous green shirt in December 1995, ending the season with a championship medal. While goalscoring has never been a major feature of his game he surprised his coach by scoring twice in the UEFA Champions League against Valencia CF and Juventus FC in 2000/01. He added two more the following season including the only goal of the quarter-final first leg against FC Barcelona, who eventually progressed. Brushed off interest from a number of European teams to sign a new four-year contract ahead of the 2002/03 season before helping the club reach the last eight of the UEFA Cup - where his absence was considered the chief reason for Panathinaikos's defeat in extra time by FC Porto. 2003/04: The Panathinaikos captain was instrumental in his side's domestic double, scoring seven goals and providing six assists. His side's best performer, he scored a superb long-range goal at Rangers FC in the Champions League to win the Greens a place in the UEFA Cup. 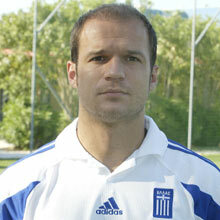 Basinas scored his first hat-trick in the December 2003 defeat of Paniliakos FC.